Although it might seem like a thing from a time that has mostly passed us by, knitting is actually still quite useful. Some of you might remember Grandma sitting by the fireplace humming and lovingly making that sweater that a family member would end up wearing for a decade or more. Knits make for excellent winter pieces and last the test of time. If nothing else, it’s a talent that can reap dividends when money is tight, or when the seesaw of supply and demand drives clothing prices above what you consider reasonable. So -- how do you learn to knit? There’s a good way, and there’s a better way. The former sometimes causes people to give up halfway through, even though these worked fine in times past when life moved at a slower pace. For example, starting with the scarf is generally not a good idea; they are deceptively hard to complete. Because it’s a seamless item, any of your beginner’s errors will show up readily, and make you want to tank it and start again. What’s the point in completing a scarf that you can already tell you won’t like halfway through? Now that you’ve seen that scarfs aren’t all they’re cracked up to be (as a first creation, anyway), what should you begin knitting? Believe it or not, a hat is actually a very good first item. It doesn’t take nearly as much time as a scarf usually ends up taking, and the form happens to hide mistakes very well. Although they can be a bit more complicated, at least you know that -- unlike a scarf -- the finished hat will be used regularly. Even if you don’t want to start off by trying to knit a hat, the point is to pick something that will make you want to finish it. Of course, you also want something that will be used. A scarf can go on and on since there’s no clear point at which it’s done; but a the completion stage of a hat or mittens is fairly obvious. Getting started can be almost as exciting as the end-stage. The sense of adventure is highlighted by perusing your local yarn store -- or the web if you’re a perpetual online shopper -- and understanding all the different kinds of thread. Nothing beats walking around a dedicated yarn store, however; in this option, you can feel the yarn and asks questions of the shop attendee. For reference, check out JOANN or Michaels for a wonderful selection of knitting material. If there are no store attendees available, here’s some advice: stick with worsted (medium-weight) yarn as a beginner. Check out the needle sizes, and pick up both a 6 and a 9. Everything should, of course, be labeled, and you’ll get the added benefit of learning the differences and the standard measurements for your next shopping trip. There are a lot of options, but for now the most important thing is needle size. In this crucial stage, you’ve got a lot of support. First of all, if you’re serious about knitting, you can easily find a group that does it together -- talk to the manager or an employee at your local yarn store to find out more. They may even have courses for beginners. If this is not an option, plenty of local libraries, various religious institutions and online organizations host gatherings specifically for knitters. The familial route is, of course, also available for those with family members and close friends who knit. If none of these are available, check out KnittingHelp.com and similar sites for information. Now that you’re ready to begin, you’ll need a time commitment for your first knitting session. Three times every week in the beginning, as you’re learning, should be enough. Do not allow distractions; once you’ve got the basics down, you’ll be able to knit with the TV or radio on with no problem at all. 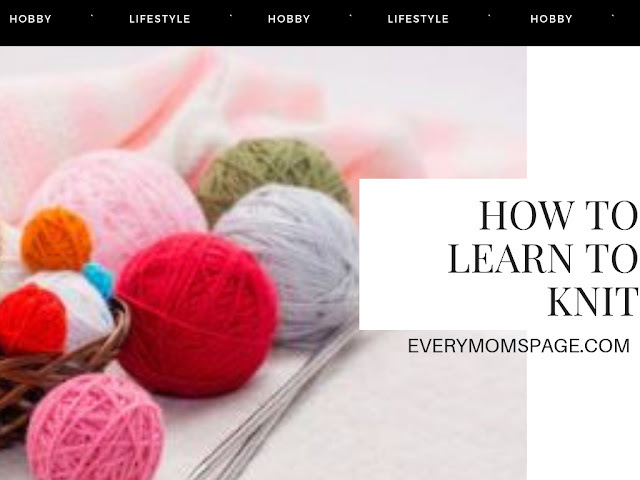 Sign up to Ravelry.com for access to a helpful and supportive community of knitters, as well as a way to show your work for support and helpful criticism (mostly encouragement though, from experience). ● Blocking: refers to the action of manipulating the finished material so that it takes on the desired shape; this step occurs after you’ve finished the project. The manipulation can involve damping, steaming, etc. ● Casting Off: Once you’ve completed your knitting project, you have to take the stitches off of the needle in a manner that doesn’t cause it to unravel. ● Casting On: this refers to actually putting the stitches successfully on the needle. ● LYS: an abbreviation for local yarn store. ● U.F.O: simply, “unfinished object”.